Biased under-reporting of research has been documented for well over two decades and the evidence for it is now overwhelming.1 2 3 4 Under-reporting is research misconduct and has serious consequences.5 6 It leads to overestimates of the benefits of treatments and underestimates of their harmful effects.7 Because of this it puts patients at risk and wastes healthcare resources. This matters because participants in clinical trials assume that they are contributing to the advancement of medical knowledge; non-publication of study results negates this reasonable assumption and betrays those who have volunteered. Non-publication also matters because failure to publish all the results from clinical trials distorts the evidence base for clinical decisions. In a Personal View published in the BMJ eight years ago, the clinical epidemiologist Alessandro Liberati protested that the unpublished results of clinical trials could have informed his choices as a patient with multiple myeloma. “Why was I forced to make my decision knowing that information was somewhere but not available? Was the delay because the results were less exciting than expected? Or because in the evolving field of myeloma research there are now new exciting theories (or drugs) to look at? How far can we tolerate the butterfly behaviour of researchers, moving on to the next flower well before the previous one has been fully exploited?”10 Just over a year ago, Liberati died from the complications of his disease, still waiting for researchers to publish information relevant to his treatment choices. What can explain this failure to publish academic trials? Journals have been blamed for a bias towards accepting positive results, and some of the blame does lie with them. But the evidence indicates that the principal culprits are authors and research sponsors for not submitting reports for publication.13 Financial conflict of interest is well understood as a motive for suppression of unfavourable results from commercially sponsored trials. But what are the motives of authors and sponsors of non-commercial trials? Authors admit failure to write up and submit their results,14 and anecdotes suggest a range of reasons, such as losing interest or moving on to new institutions and projects, poor organisation, inadequate resources, writer’s block, or unwillingness to accept the results of a trial owing to intellectual or reputational investment in the outcome. Despite the billions of pounds wasted, there has been too little systematic effort to monitor the extent of non-publication, let alone investigate the reasons for it. But authors’ behaviour is unlikely to change without firm action from those who give ethics approval, institutional hosting, and funding support for trials. Research ethics committees were challenged long ago to behave ethically by ensuring that results of trials were published,16 yet these committees have been noticeable by their absence among those exposing under-reporting of clinical trials and taking steps to tackle the problem. It is clear from the figure that academic institutions and funders of research have similarly failed in their responsibilities. There are exceptions, however: the figure also shows that 98% of the studies funded by the National Institute for Health Research Health Technology Assessment Programme have led to the publication of full reports (Ruairidh Milne, personal communication). The programme has achieved this by holding back a proportion of the research grant until a report has been submitted for publication, by chasing authors on a regular basis, and by providing a publication vehicle—Health Technology Assessment—for all trials. This shows what can and should be done. Information made public through trial registration means that research funders and institutions that continue to under-report clinical trials can now be identified. Patients who are invited to participate in trials should consider the track record of the institutions and funders concerned and refuse to participate unless they receive written assurance that the full study results will be made publicly available and freely accessible (box). Agree to participate in a clinical trial only if: (1) the study protocol has been registered and made publicly available; (2) the protocol refers to systematic reviews of existing evidence showing that the trial is justified; and (3) you receive a written assurance that the full study results will be published and sent to all participants who indicate that they wish to receive them. A campaign to ensure that all trials are registered and their results published, or otherwise made publicly available, is launched this week (alltrials.net). We invite all BMJ readers to sign the campaign’s petition. Competing interests: We have read and understood the BMJ Group policy on declaration of interests and we have no relevant interests to declare. Chalmers I. Proposal to outlaw the term “negative trial.” BMJ1985;290:1002. Dickersin K, Chalmers I. Recognising, investigating and dealing with incomplete and biased reporting of clinical research: from Francis Bacon to the World Health Organisation. 2010. www.jameslindlibrary.org/illustrating/articles/recognising-investigating-and-dealing-with-incomplete-and-biase. Song F, Parekh S, Hooper L, Loke YK, Ryder JJ, Sutton AJ, et al. Dissemination and publication of research findings: an updated review of related biases. Health Technol Assess2010;14(8). Chalmers I. Underreporting research is scientific misconduct. JAMA2010;263:1405-8. A consensus statement on research misconduct in the UK. BMJ2012;344:e1111. McGauran N, Wieseler B, Kreis J, Schüler Y-B, Kölsch H, Kaiser T. Reporting bias in medical research—a narrative review. Trials2010;11:37. Liberati A. An unfinished trip through uncertainties. BMJ2004;328:531. MRC Multicentre Otitis Media Study Group. Adjuvant adenoidectomy in persistent bilateral otitis media with effusion: hearing and revision surgery outcomes through 2 years in the TARGET randomised trial. Clin Otolaryngol2012;37:107-16. Torjesen I. Sentinel node biopsy for melanoma: is it worth it? BMJ2013;346:e8645. Chalmers I, Dickersin K. Biased under-reporting of research reflects biased under-submission more than biased editorial rejection. F1000 Res2012;1:69. Smyth RMD, Kirkham JJ, Jacoby A, Altman DG, Gamble C, Williamson PR. 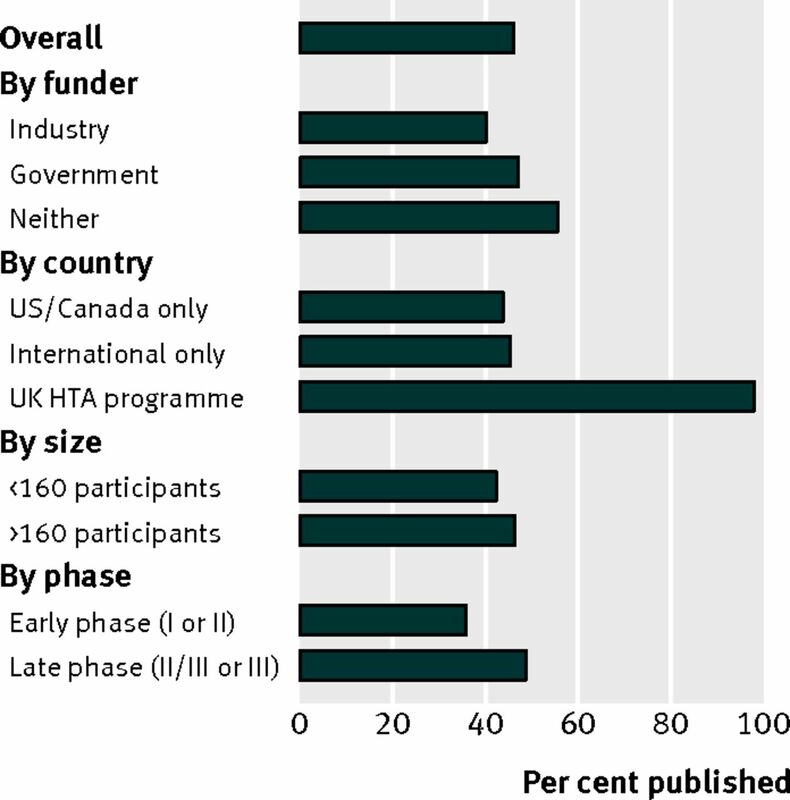 Frequency and reasons for outcome reporting bias in clinical trials: interviews with trialists. BMJ2012;342:c7153. World Medical Association. Ethical principles for medical research involving human subjects. 2008. www.wma.net/en/30publications/10policies/b3/. Savulescu J, Chalmers I, Blunt J. Are research ethics committees behaving unethically? Some suggestions for improving performance and accountability. BMJ1996;313:1390-3. Evans I, Thornton H, Chalmers I, Glasziou P. Testing treatments. Pinter and Martin, 2011. www.testingtreatments.org.